There were last-minute fears that three teams slated to begin the race - one each from India, Germany and Korea - would miss the start after they struck trouble. Ultimately all vehicles got away from Darwin's State Square on Sunday, with Korea's "Green Maniac" car starting about an hour after the race favourite, Solar Team Twente from the Netherlands. The teams are aiming to travel to Adelaide - more than 3000 kilometres away - using vehicles powered only by energy from the sun. Event director Chris Selwood told AAP he was delighted by the start, even though he predicted some teams would probably not make it all the way to Adelaide without a little help. "There have been a few tears at the end," Mr Selwood said. "The Indians made it across the starting line, and that is magnificent. "They managed to pass the safety standards, but in reality I am sure our officials will be not far behind them and at some stage asking them to put their car in their trailer and move forward to the next checkpoint." Unlike at typical car races, vehicles in the World Solar Challenge set off one after another, with about a minute separating each entrant's start. Some cars in the race can cruise above 100 kilometres an hour and get short bursts of speed above 150km/h, although for safety reasons officials brought in rules in 2007 to limit their power. The competitors will travel down the Stuart Highway and it is expected the top teams could reach Adelaide as early as Wednesday afternoon, as long as the sunny weather continues during the trek. The 2009 winner, Team Tokai from Japan, started fifth on the grid and soon took an early lead. 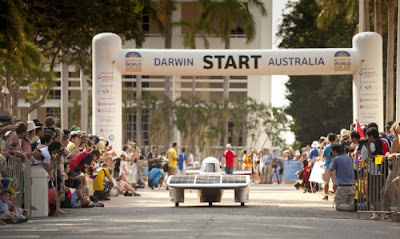 The first Solar Challenge from Darwin to Adelaide was in 1987 although it is not an annual event, and this year marked the 11th time the race has been held.